If you have ever visited this site before, you will know that I am always changing things around and finding new ways of doing things. So, a new spread….. Here is a Tarot Spread based on the The Six Directions. The six directions are North, South, East, West, Great Mother Earth and Great Spirit Sky. The Sun, bright ideas, optimistic thoughts, hopeful and promising ideas, thinking things will turn out well. Six of Wands, victory won through passion, drive creating success, coming out on top with zeal and fire. Queen of Pentacles, dealing with peoples feelings, grounded emotionally, well directed feelings, good use of emotions, kind feelings, sharing emotions. Six of Cups, physical connection, sharing physical things, getting close through material objects, sharing precious things. 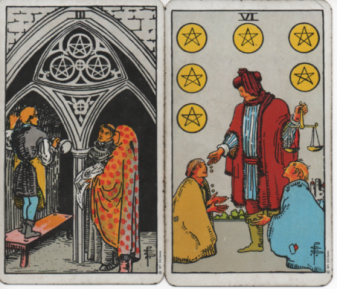 Three of Pentacles, learning about connection to the Earth, student of Mother Earth, apprenticeship to the Great Mother. Six of Pentacles, dedicated service to Great Spirit, honouring Spirit with time, energy and material resources, many calls on time and energy from Great Spirit. 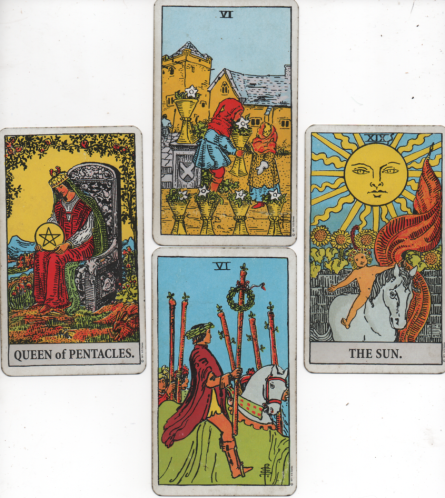 Bartering Tarot Readings would seem like a pretty good idea from all aspects of The Six Directions Tarot Spread!! If you would like a reading from me please click here.